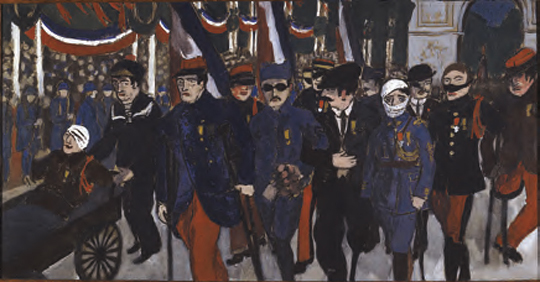 As part of the commemorations of the Great War, the Bibliothèque de documentation internationale contemporaine and the musée de l’Armée present a joint exhibition under the theme of the pictorial representation of the Great War by its contemporaries. What did the soldiers experience during the Great War ? What did they chose to represent and why ? What did the official war artists involved in the mobilization effort bring back from their missions to the Front ? 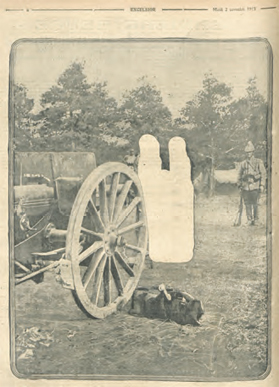 How were these pictorial representations distributed on the home front ? All these questions stress the absence of a uniform representation of the First World War. 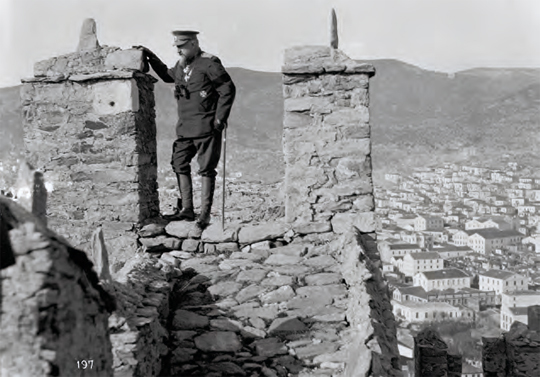 This exhibition addresses this issue as it reflects on the approaches to the different Fronts: the Western Front of course; but also the lesser-known German-Russian Front, the Austro-Italian Front, the fronts in the Middle-East, the Dardanelles and the Balkans. The artistic avant-garde production and the illustrated propaganda are better known to the public than the works of soldiers and official war artists. As for the witnesses of the Great War testifying to their combat experiences and the harsh reality of the Front remained an important issue all along. The objective of this exhibition is to highlight the diversity of these representations based on the exceptional collections started in the early stages of the war by all warring nations to serve as testimony. The exhibition View from the Front. Representing the Great War will offer to the visitor a complete picture of the representations of war by those who lived through it - for the very first time. Private and official paintings, drawings, photographs and newspaper articles, reels, posters, artefacts including unpublished material reflect the wide diversity of individual testimonies. 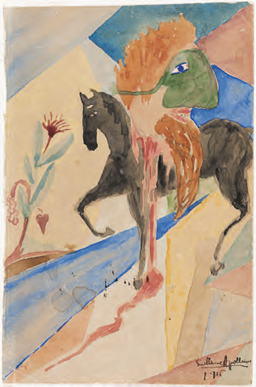 Among the 500 pieces presented in the exhibition, we can admire works of art signed by some of greatest artists of the so-called Generation du Feu : the Nash brothers, William Orpen, Otto Dix, Guillaume Apollinaire, Anselmo Bucci, Jacques Villon, Fernand Léger as well as paintings by official war artists sent to the Front such as Félix Vallotton, Edouard Vuillard and Georges Scott. The 800 square meters exhibition is bringing together for the first time an exceptional and complementary display of works from the BDIC and the musée de l’Armée. 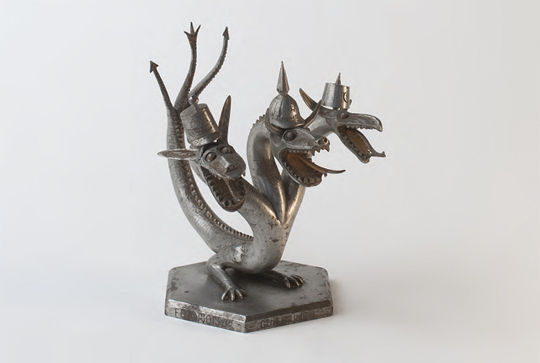 All throughout the conflict, both institutions collected material and a whole variety of art pieces produced on the Front, thus constituting internationally recognized reference collections. Thanks to the loans from major French museums such as the Historial de la Grande Guerre (Peronne), the Musée d’Art Moderne (Paris) and prestigious European museums such as the IWM (London), the Deutsches Historisches Museum (Berlin), the Heeresgeschichtliches Museum (Vienna) and the Museo Storico Italiano della Guerra (Rovereto), all these work of arts can be contrasted and placed in perspective with one another. Trailer of the exhibition View from the front. 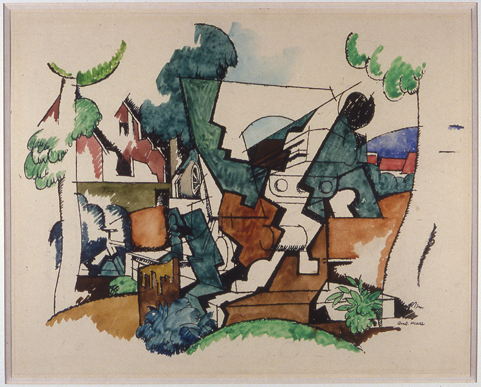 During the first decade of the Twentieth Century, war pervaded both in the arts and the media all throughout Europe. From August 1914, the conscription of millions of men and the full mobilization of states brought decisive new dimensions to the war. Soon, the Front became the new reality of war. How did the contemporaries perceive the war and did they meet the challenges posed by its pictorial depiction and representations. 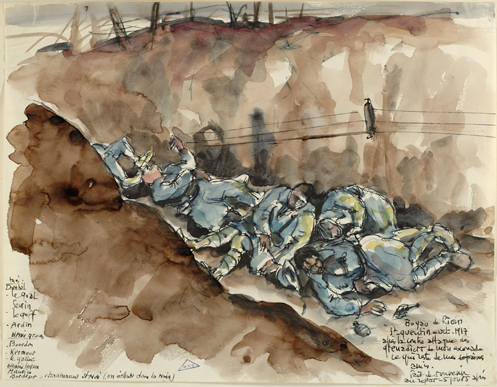 In addition to sketch artists, painters and soldiers already serving on the front lines, government agencies and official war artists were also commissioned for documenting information and construct a visual discourse. 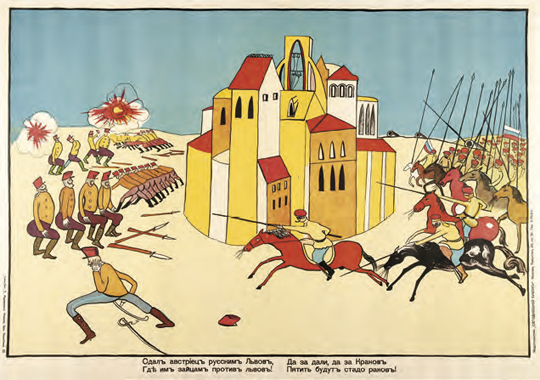 From the Western Front, thousands of pictorial representations of war circulated through Italy, the Middle-East and Eastern Europe, some of which causing an unprecedented interest. The widely distributed representations of combats, the modernity of a war fought on a massive scale and the daily life on the Front still bear witness to the personal experience of all servicemen throughout the duration of the conflict. These representations fully became part of the collective memory which extended well beyond the 14-18 years and literally shaped the Twentieth Century. The people in Europe did not find out about the war in 1914. For more than 30 years, they have been living with the memory of past and contemporary wars. Thanks to the substantial role played by paintings, engravings and the illustrated press, the 1870-71 war, the Boer War, the Boxer Rebellion, the Balkan wars and the military expeditions in Africa and Asia were brought into the visual culture. Each year, the presence at the exhibition of works portraying the war, at times repeated in engravings, enlivened the discussions. The increasing use of photographs in the press, the rapid development of the cinema and attempts to record sound revive contemporaries’ view by asking the question, among others, as to whether reality is portrayed. 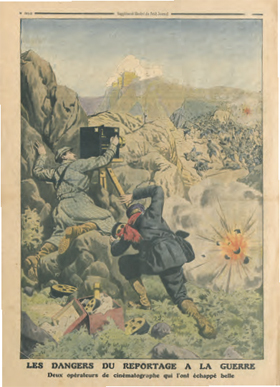 The new media play a decisive role in an increasingly massive and instantaneous coverage of information, particularly in 1904-1905 during the Russian-Japanese war and in the Balkans in 1912-1913. 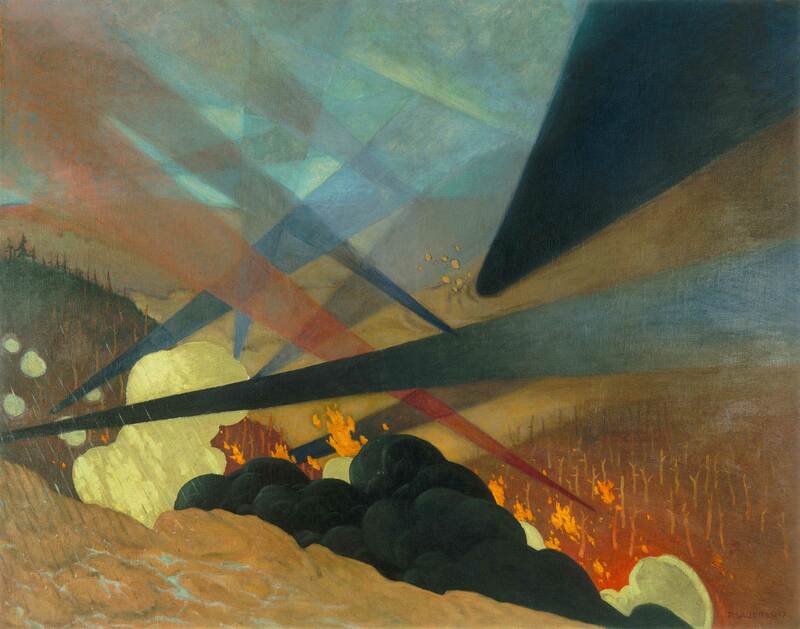 These two conflicts, which stand out by their modernity, inspire pictorial trends such as futurism and alter how war is portrayed, particularly by not concealing anything of the mass destruction. 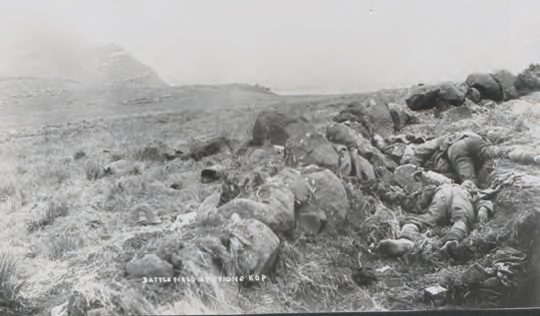 The actual conflict gradually took over from an awaited war, as perceived by the millions of men mobilised. Their view is therefore conditioned by the discovery of combat, the experience of the front, the incredible violence of the battlefield and the spreading out of the trenches. 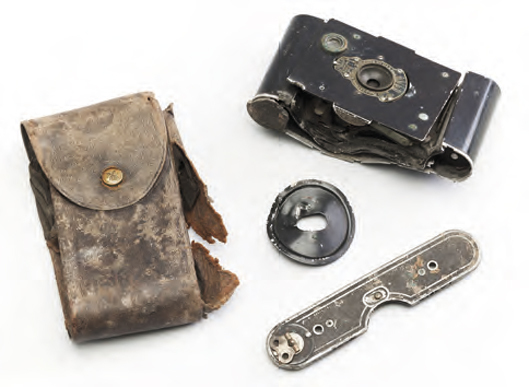 The soldiers sometimes took sketchbooks or cameras to the front; some of them also used whatever materials were available in the trenches. So the war started to be documented by the accounts of those who fought it, whether they were professional artists, amateur illustrators or photographers. 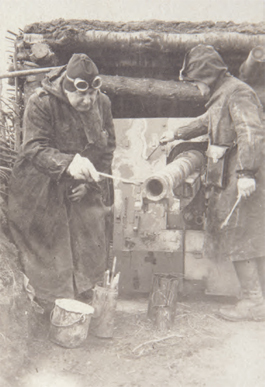 At the same time, the various warring nations commissioned painters and photographic services to cover the conflict, both to document it and to provide the public with controlled images. 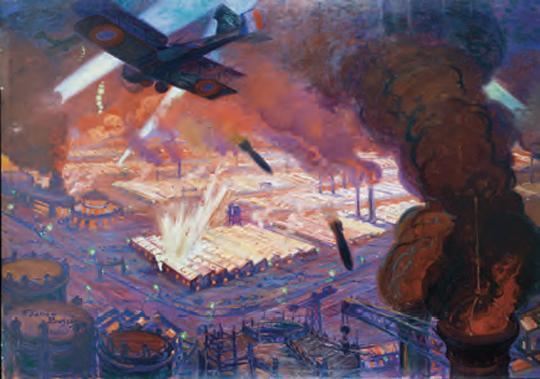 Portrayals were then circulated of a war different from the one that, up to then, artists, newspapers, illustrated magazines and the cinema imagined: they showed the mass destruction, battlefield landscapes laid waste and the confined environment of the trenches. 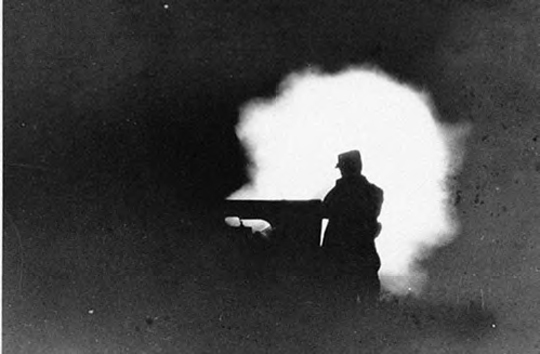 On the western front, stabilisation of the front transformed the war into a never-ending siege. The intensity of the confrontations only rarely interrupted a daily life marked by a lack of privacy, destitution, suffering and death. Paradoxically, the combats and assaults, experienced or imagined, were still the subjects for those who portrayed the conflict. Very much appreciated behind the lines, works representing the offensive and movement, also responded to the idea that civilians had of the war. Difficult to portray on the spot and to its full extent, the fighting was often conjured up by new weapons whose forms and effects fascinated, by the camouflage devices, and finally, by the destruction. All accounts of the war and its unexpected developments. The images produced in this context are a vehicle for sharing experiences between the combatants and the rear and also between the combatants themselves, preoccupied with transmitting their experience of the front, to share it and overcome it. The works produced on the front transposed the immediate experience of the violence and chaos of war into images and stories. Right from the start of the fighting, films where reality and reconstitution are mingled, collections of engravings, private albums or those intended for publishing, exhibitions, the appearance of public or private collections concerning the war, are all proof that combatants and civilians need to put the events back into an individual and collective history. 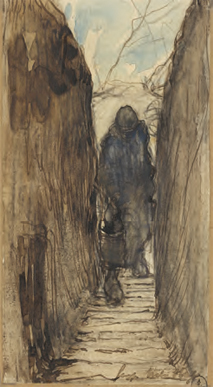 The multiplicity of points of view on the war are expressed thanks to the techniques inherited from tradition – drawing, engraving, painting – and by photography and film, the modern means of portrayal. On the other hand, poets and artists, painters, photographers and filmmakers are influenced by the countless maps, technical documents and images generated by war and assumed to be objective. They also change their view of the conflict, without providing them with a means to reproduce sounds, odours, taste and feeling, and to enable them to share their experience in all its complexity. When the war was nearing its end, new subjects appeared: the return from the trenches, the victory, the fear of being forgotten, and the refusal of defeat. Then, years, sometimes decades after the conflict, the experience of the front continued to haunt soldiers who had their stories published and works which remained unpublished or which later on returned to the subjects repressed for many years. 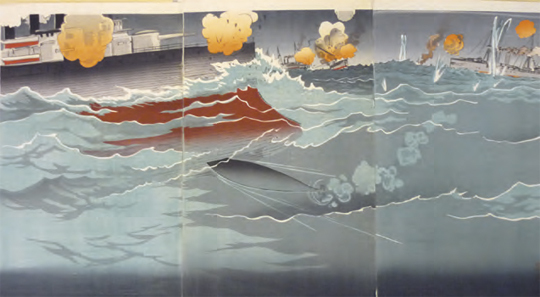 Grande bataille navale de Ryōjun [Lüshunkou]. The international conference Painters and the Great War: commissions, production and collections – towards a comparative history is organized by the CREA (EA 370) of the Université de Paris Ouest Nanterre La Défense, the Bibliothèque de documentation internationale contemporaine, the musée de l’Armée and the Centre for Studies and Research on the German-speaking area (EA 4223) from December 4 to 6, 2014. This international conference takes as its subject the representations of the First World War by painters who experienced it. It will consider the works produced, and the conditions of their production, diffusion and reception. The principle focus will be on France, Great Britain and Germany, but the conference will also be open to broader comparisons with other countries engaged in the conflict including Italy, Russia, Belgium, Austria, the United States, Canada and Australia. Particular attention will be given to the institutional context of works’ production and diffusion, in connection with other themes and approaches. RER A Station Nanterre Université (15 minutes from the centre of Paris). Train L Station Nanterre Université (from the Gare Saint-Lazare). > "Missions, official commissions, public and private collections". Université de Nanterre. Building V, Auditorium V.
> "Official artists and avant-gardes". Musée de l’Armée. Auditorium Austerlitz. 9:30 am – 6:00 p.m.
Université de Nanterre. Building B - Conference Hall. 10:00 am – 4:30 p.m. 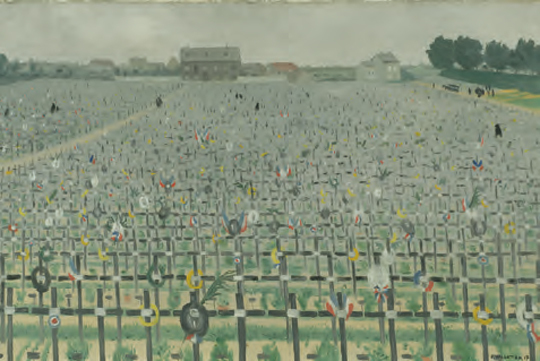 The musée de l’Armée and the Université permanente de la Ville de Paris organize a series of 4 conferences entitled At the very heart of and around the Great War which concern the various aspects of the First World War. Auditorium of the musée de l’Armée. 1:45 p.m.
Christophe Pommier - Musée de l’Armée. > "Invisible Wounds and the Great War". > "The Tomboy and the Killer, the story of Paul and Louise, a deserter turned transvestite in the Paris of the Roaring Twenties". > "Near or distant. 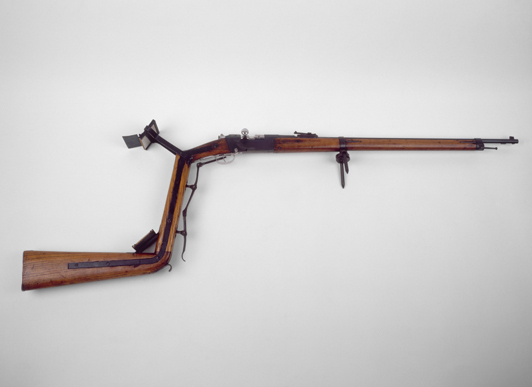 Trench warfare in the collections of the musée de l’Armée". Mathilde Benoistel and Laëtitia Desserrières - Musée de l’Armée. 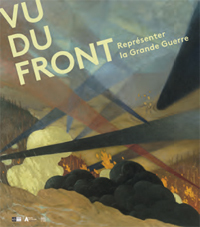 From November 18 to 22, in conjunction with the exhibition « Vu du Front. Représenter la Grande Guerre », the musée de l’Armée presents a series of film screenings on the Great War, the matrix event of the Twentieth Century that holds a unique place in cinema. An opportunity for the public to discover or rediscover iconic films such as King & Country by Joseph Losey (1964) or Johnny Got His Gun by Dalton Trumbo (1971). Tuesday November 18, 2014 at 7:30 p.m.
Capitain Conan Directed by Bertrand Tavernier. France – 1996 (Colour - 130 minutes). Based on the Roger Vercel novel of the same name. Starring: Philippe Torreton, Samuel Le Bihan, Bernard Le Coq, François Berléand, Claude Rich, Catherine Rich. In September 1918, at the Bulgarian border, Captain Conan and his unit of 50 men, most of them former convicts, wage war by employing rather unorthodox methods such as close-quarters fighting, an efficient practice which proves to be deadly. On November 11, 1918, the Armistice is signed with Germany. However, the Armée d’Orient does not demobilize and carries on fighting. 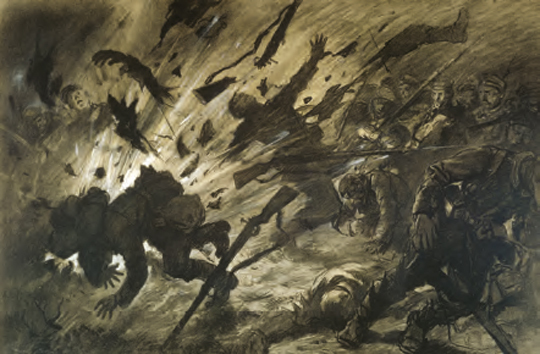 Billeted in Bucharest in allied Romania, Captain Conan’s soldiers create chaos and engage in looting and murder. As a commissioner and special rapporteur Norbert, an officer who had befriended Conan, is faced the difficult task to apprehend the culprits and bring them to justice. Wednesday November 19, 2014 at 7:30 p.m. The Officers’ Ward. Directed by François Dupeyron. France – 2001 (Colour - 135 minutes). Starring: Éric Caravaca, Denis Podalydès, Grégori Dérangère, Sabine Azéma, André Dussollier. 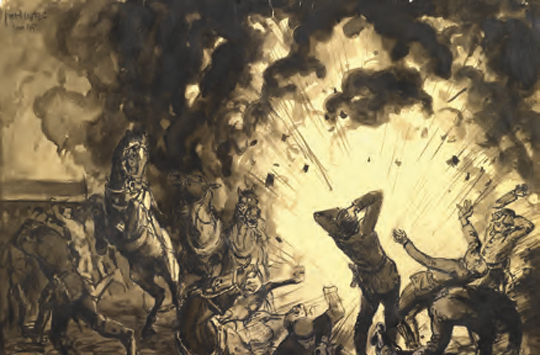 At the beginning of August 1914, during a reconnaissance mission on horseback, Adrien – a young and attractive lieutenant, is hit by burning shrapnel that blows off the lower part of his face. He spends the rest of the War in the Parisian military Hospital of the Val de Grace in a special ward reserved for officers suffering debilitating disfigurement: a den of human suffering in which each sees in the eyes of the other the expression of what he himself is missing. Thursday November 20, 2014 at 7:30 p.m.
Johnny Got His Gun. Directed by Dalton Trumbo. USA – 1971 (Colour – Black and white - 111 minutes). Starring: Donald Sutherland, Jason Robards, Charles McGraw, Timothy Bottoms. During the course of the Great War, Joe Bonham a young American full of enthusiasm decides to join his fellowmen at the Front. Following a massive bombardment, he wakes up in a hospital. While attempting to regain consciousness he soon realizes that he can no longer rely on his sense organs and that he has lost all his limbs. Friday November 21, 2014 at 7:30 p.m.
King & Country. Directed by Joseph Losey. UK – 1971 (Black and white - 86 minutes). Based on John Wilson’s play Hamp and James Lansdale Hodson’s novel Return To The Wood. Starring: Dirk Bogarde, Tom Courtenay, Leo McKern, Barry Foster. As part of the Mois du film documentaire, a series of documentaries on « War Letters » is organized by the Bibliothèque de documentation internationale contemporaine (BDIC) and the Bibliothèque publique d’information (BPI). November 7 to 27, 2014. All screenings will take place at the Bibliothèque publique d’information (BPI). Echoing the exhibition, 9 concerts will be held in the prestigious Hotel des Invalides. This musical programming was organized jointly by the musée de l’Armée and the French disk label Éditions Hortus. Thursday October 16, 2014 at 8:00 p.m. The French Air Force Orchestra. A tribute to Henri Dutilleux (1916-2013). > Reserve your tickets online. Friday November 14, 2014 at 8:00 p.m. Au pays où se fait la guerre (In a country where war is raging). An artistic partnership with the Palazzetto Bru Zane – Centre de musique romantique française in Venice. Monday November 17, 2014 at 8:00 p.m.
With the support from the cultural services of the Embassy of Israel in France. Thursday November 20, 2014 at 8:00 p.m. The Symphonic Orchestra of the GARDE REPUBLICAINE. Thursday December 4, 2014 at 8:00 p.m.
An artistic partnership with the French disk label Éditions Hortus. Sunday December 7, 2014 at 5:00 p.m.
With the support from the Embassy of the Czech Republic in France. Friday December 12, 2014 at 8:00 p.m.
With the support from the Embassy of Morocco in France. Thursday January 12, 2014 at 8:00 p.m.
Friday January 23, 2014 at 8:00 p.m.
Pre-booking required 15 days before the visit. We offer family and guided school visits (From primary to secondary school). Visits are also available for students and student-teachers. The number of participants is limited to a maximum of 25 per visit (accompanying teacher included). > Blog of the exhibition View from the front. Representing the Great War (click here, to enter the blog of the exhibition, new window). 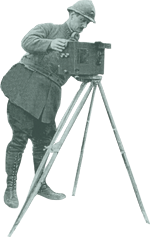 Prior to 1914, no conflict had generated as many intense images as the First World War. 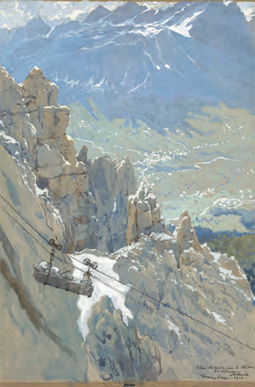 In addition to sketch artists, painters and soldiers already serving on the front lines, government agencies and official war artists were also commissioned for documenting information to construct a visual discourse. From the Western Front, thousands of pictorial representations of war circulated through Italy, the Middle-East and Eastern Europe, some of which causing an unprecedented interest. The widely distributed representations of combats, the modernity of a war fought on a massive scale and the daily life on the Front still bear witness to the personal experience of each fighting men. These representations fully became part of the collective memory which extended well beyond the 14-18 years and literally shaped the Twentieth Century. An exceptional presentation of some 450 works of art and documents - objects, paintings, drawings and photographs - from the collections of the Bibliothèque de documentation internationale contemporaine (BDIC), du musée de l’Armée and some of the finest French and European institutions, provides an opportunity to understand all aspects of the front, as seen by those who lived through the war. Format: 24.6 x 28 cm. Under co-editing agreements between the Bibliothèque de documentation internationale contemporaine (BDIC), the musée de l'Armée and Somogy éditions d'Art. > Buy the catalogue of the exhibition (click here, to enter the site of the RMN, new window). Books around the exhibition are on sale in our bookshop. > Download the bibliography of the exhibition Vu du front. Représenter la Grande Guerre (pdf file, 77 Ko, new window). > Special feature on the First World War Centenary (click here, to enter the site of musée de l'Armée, new window). > "The Great War Portfolio" (click here, to enter the site of musée de l'Armée, new window). The young visitors’ itinerary starts in the main courtyard where mystery objects are reproduced on four didactic panels on display on the pillars. You should then proceed to the exhibition which starts on the ground floor up and ends up on the third floor. Nine didactic panels and notices designed especially for children offer a playful way and a concrete approach of both images and objects. 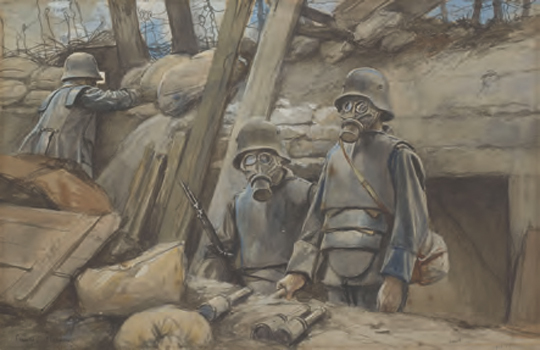 A fun and enriching activity for the whole family to better understand how professional and emerging artists chose to depict the Great War. The Discovery Booklet of the exhibition. To complete your visit, don’t forget the Discovery Booklet of the exhibition for children as from 8 years available at the Information desk of the temporary exhibition or free download. > Download the View from the front. Representing the Great War Discovery Booklet in french (pdf, 1.8 Mo, new window). Until October 31 : Monday to Sunday, from 10:00 a.m. to 6 p.m.
From November 1 : Monday to Sunday from 10:00 a.m. to 5:00 p.m. The tickets offices close down 30 minutes before the museum. The museum is close on December 25, 2014 and January 1, 2015. During christmas holidays, from December 20, 2014 to January 4, 2015 (except on December 25, 2014 and January 1, 2015), the museum is open every day from 10:00 a.m. to 5:30 p.m. 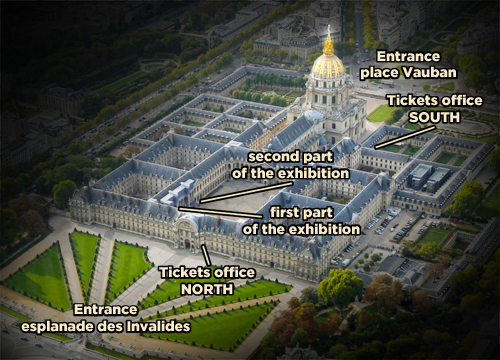 The tickets offices are located at both entrances of the museum : coming from the Esplanade des Invalides (North Entrance) or from the Place Vauban (South Entrance). Visitors under the age of 18, students of the "Université Nanterre (Paris ouest)", unemployed individuals and visitors receiving benefits (proof of entitlement must be dated within the last six months), disabled visitors and their helper, journalists, members of ICOM and ICOMOS, visitors with Paris Museum Pass, personnel of the Department of Defense, french and foreign armed forces personnel (in uniform). The exhibition View from the front. 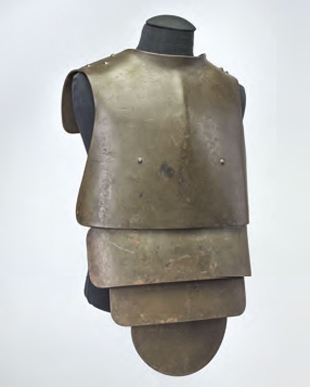 Representing the Great War is co-produced by the musée de l'Armée and the Bibliothèque de documentation internationale contemporaine. Caroline Fieschi, Curator of the museum of the "Bibliothèque de documentation internationale contemporaine – Université Paris Ouest Nanterre la Défense"